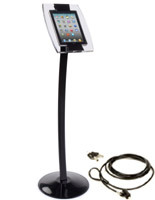 Looking for an iPad Air holder for floor or countertop display? 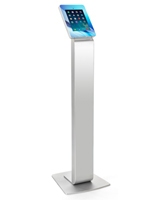 The 5th-generation Apple tablet (which is, technically, what the Air is) is much the same yet wildly different from its earlier siblings. 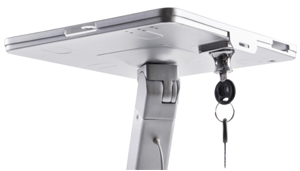 The Apple iPad Air holder is also much the same as enclosures designed for other tablets, with a few modifications that make all the difference. 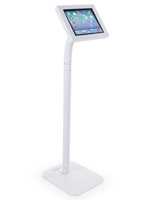 The newer devices have the same screen size as the iPad2, but different resolution, a retina display, and a significantly smaller, lighter and thinner screen surround. 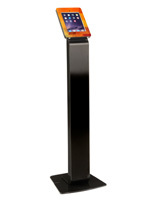 Not to mention a faster processor, among other goodies. 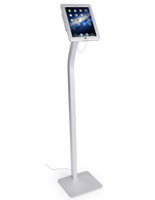 iPad Air holders, like other hands free tablet stands and covers, accommodate the new measurements and can handle the blinding processing speed just fine. 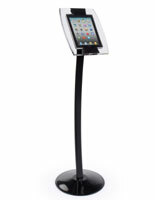 Like the Six Million Dollar man, the new iteration is better, stronger and faster than the one before. 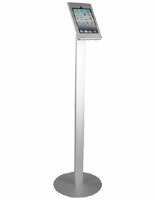 Which makes it ideal for commercial, public use in a variety of environments and situations. 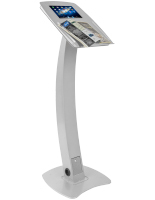 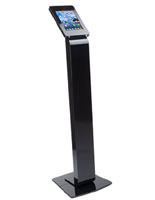 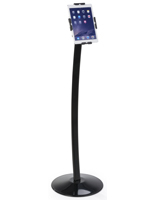 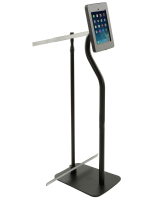 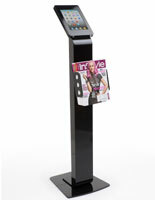 What makes a hands free tablet stand a good choice for use as a podium or lectern? 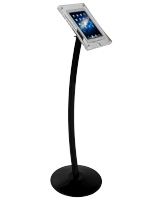 Lectures and presentations of all kinds are easy when using a hands free tablet stand. 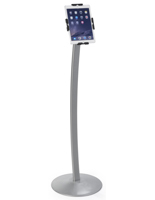 Freestanding cases work quite well in these situations, although desk or countertop covers with universal brackets are sometimes better for more smaller meetings or readings. 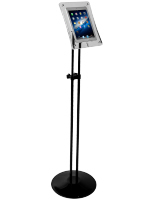 Speeches and readings are the perfect opportunity to use our lectern-style stands. 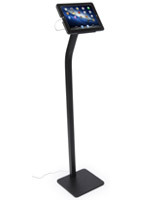 An iPad air mount is as well suited to pulling up a simple reading from a sacred text during a ceremony as it is for a poetry slam reading. 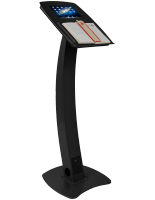 Bookstores, places of worship, stores, clubs, off site event locations and more all benefit from this type of text holder. 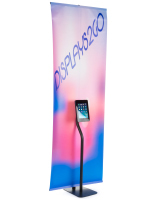 Product demonstrations, depending on the location and the product, can use either freestanding or handheld Air holder cases. 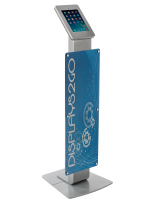 Certain products or programs are more effective in a rotating enclosure, while still others can be accomplished in a fixed-mount case and others in a portable universal bracket cover placed on a desk or table as needed. 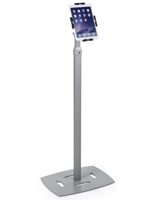 Salespeople in all environments have learned the benefits of interactivity for drawing customer interest, and these lightweight Apple accessories are ideal tools for almost any job. 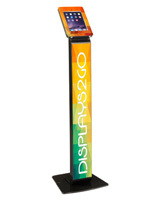 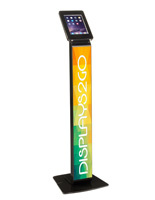 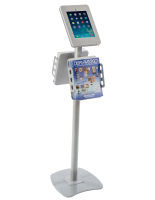 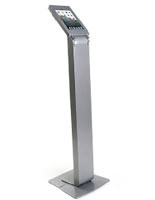 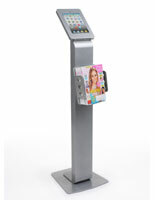 Interactive stations in retail, hospitality and retail environments frequently use podium-style hands free tablet stands to allow customers to interact with merchandise lists and products to create personalized experiences, menus and service structures. 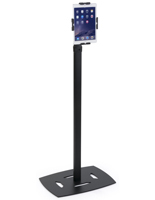 Trade shows are one of the best places for a iPad air mounts. 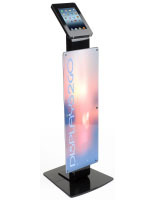 Depending on the products or services, mounting solutions can include built-in custom graphics, custom programming for the apple accessories. 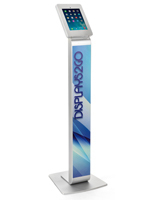 Locking cases, floor stands with rotating enclosures, lightweight desk or countertop cases are all ideal ways to both attract passersby to exhibit booths and to get them to interact with apps or products. 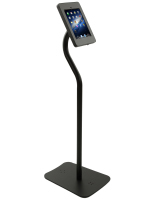 Commercial grade hands free tablet stands come in a variety of sizes, shapes and configurations, from modern updates on traditional reading stands to high-tech holders with rotating device enclosures and integrated charging stations to simple covers with universal brackets for desk or handheld use. 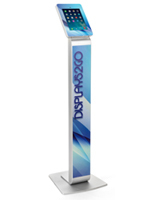 From cable management to height adjusting stands with custom-branded graphics, these Apple accessories are a superior choice for presentations, speeches and demonstrations of all kinds.